Leprosy has a rich history dating to biblical times. 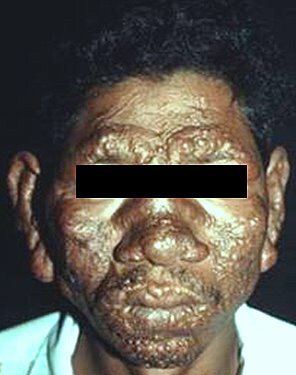 â€œLeperâ€ is an ancient term used to identify patients with leprosy who were severely stigmatized by the deformity that resulted from Mycobacterium leprae infection. 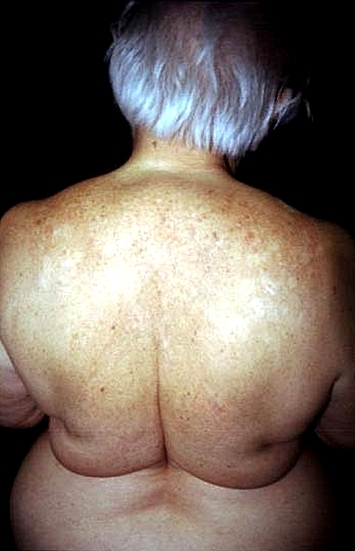 In the clinical context, the term Hansenâ€™s disease should be used instead of leprosy. Gerhard Henrick Armauer Hansen, a Norwegian physician, discovered the microbe in 1874 just before Kochâ€™s discovery of Mycobacterium tuberculosis. This disease is probably spread by the respiratory route, like tuberculosis. The clinical manifestations of leprosy are closely related to the polarity of the cellular immune response to M. leprae in the patient. The history of a patient with suspected leprosy should include whether the person has resided in an area with high prevalence and whether the person has been previously diagnosed or treated for leprosy. Certain patients may deny knowledge of a prior diagnosis or may report that skin lesions or neuropathy or both are acute, as they wish to avoid the stigma of a diagnosis of leprosy, even in emigrants to developed countries. 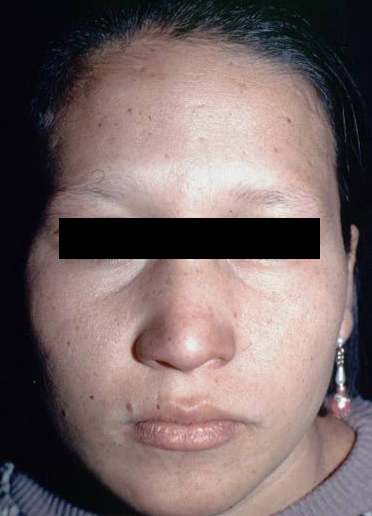 If lepromatous leprosy is left untreated, it can progress to â€œleonineâ€ facies as seen in the following images. This includes physical exam and skin biopsy. Once monthly: Rifampin, Dapzone and Clofazimine for two years and then stop. Daily: Sulfone and Clofazimine for two years and then stop. they keep telling me it vitiligo or something… till they did a biopsy (at my request!) that was when they got a puzled look still not believing its possible, when i said it was numb, i didnt feel the needle. a day later and there is no sorreness. what gives? doctors. waiting on results would like to visit with someone knowledgeable of early diagnosis… single father of two young children, what are chances of them getting it. it started with two light spots 1/2 inch. on geneticals(as my son calls em) now i noticed an darker spot 3 inch. on my ankle, i thought it was from a old injury, sort of puffy and rough??? I was watching a program on either the History Channel or National Geographic and they were discussing how people with Leprosy were ostrasized and banished from their villiages( in India and Africa). I knew that Leprosy still existed but I had thought that the Medical Establishment had made it clear to these very superstitous people that they couldn’t catch it from touching the people or living with them. It made me sad to think that people still reacted to something that has been around for over 2000 years and is treatable in this horrible way. I live in Canada and about 5 years ago I started to develope a very strange rash. I thought that I had leprosy and went to my doctor. Although it is very , very rare in Canada ( about 500 cases are diagnosed each year ), I thought that I must of developed it when travelling. However, I was told I have excema. I have tried everything to get rid of the excema and nothing helps it. They are not even sure what it causing it. I am wondering if the medication used in Leprosy might work for excema? I am at my wits ends and I have no other options. Nice synopse on leprosy. I thought leprosy was all but irradicated? Interestingly, it also causes neuropathy and foot ulcers as seen in DM.